San Diego’s landmark water recycling project got a major boost Monday when the Environmental Protection Agency renewed a permit for the aging Point Loma Wastewater Treatment Plant. The new five-year permit allowing ocean discharge from the plant means the city won’t have to spend $1 billion or more on upgrades and can instead invest that money into the largest water recycling plant in the United States. 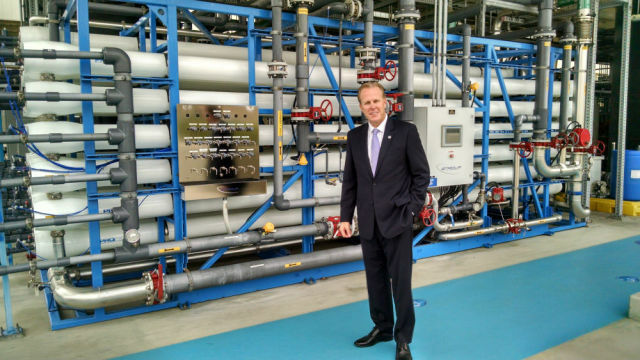 “This is huge for San Diego because we’ll be able to avoid unnecessary and expensive upgrades at the Point Loma plant and can instead invest those dollars to create an independent, drought-proof water supply for our residents,” said Mayor Kevin Faulconer. “With this permit renewal, the EPA is showing strong support for our Pure Water recycling program as we chart a path toward water independence,” Faulconer added. Pure Water San Diego is the city’s program to provide one-third of San Diego’s water supply locally by 2035 through recycling wastewater instead of pumping it into the ocean. A prototype plant is already in operation in Miramar, and the first phase of a larger facility is expected to break ground next year and open in 2021. The finished recycling plant would provide 30 million gallons of water a day, which would be mixed in reservoirs with water from traditional sources. Last month, the EPA invited the city to apply for a $492 million federal loan to help fund the initial phase of the multi-billion-dollar recycling project.